On November 13th, 2011, at 2 p.m. Bill Dieffenbach will lead an intimate behind-the-scenes tour of the Adam-Derby House at 34 Derby Court in Oyster Bay. Built in 1878 by Sarah Adam and designed by Potter and Robertson, the Queen Anne style house was the home of Richard Derby and Ethel Roosevelt Derby from 1915 until Mrs Derby’s death in 1977. The house entered the National Register of Historic Places in 1979. Mr Dieffenbach, the property’s owner since 1990, will discuss his ongoing restoration projects at the Adam-Derby House. Weather permitting, he will lead a brief visit to the nearby Sampson-Adam-Folger Cemetery. Registration: This special tour is limited to a maximum of ten attendees. Through the years women have been the driving force of fashion. Walk the streets of New York City in the 1890s and you would be captured by the sounds of rustling flowing fabrics, glistening hat pins on large brimmed feathered hats and beaded purses. Today skirts may be shorter, tops lower, heels higher, but we are still enamored with fashion and how it affects a women's persona. The Oyster Bay Historical Society's textile collection has exquisite examples of fashion through the ages. We have highlighted each piece from our collection for its unique contour, fabric and style. Fashion is a statement that has been worn by women as a work of art. In this exhibition the chosen textiles are showcased because of their good condition and their timeless style that is still wearable today. Since 1960 the Oyster Bay Historical Society has collected over 200 individual items of textiles, costumes, and fashion accessories. Materials include apparel and shoes, hats and fans, flags and quilts, bibs, bonnets, and stockings, among many others. Much of the collection was first documented and photographed by Oyster Bay High school interns (including the daughter of current Society Trustee Steve Walker). Today, the Society is preparing a fully digital catalog of this growing collection. The Oyster Bay Historical Society’s desire by exhibiting selected pieces from our extensive collection of textiles is to raise awareness and funds for the importance of conservation. We can count on the generosity of our members, patrons and sponsors for conservation funds to preserve this irreplaceable collection. Current members are most welcome. There will be a special free screening of Fireboats of 9/11, a 70-minute A&E video documenting the fireboat response to the World Trade center attacks in 2011, with archival footage of the general history of fireboat service in New York City’s harbor. 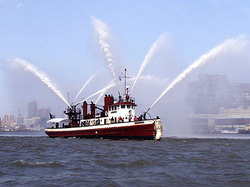 Combining archival materials with contemporary footage and state-of-the-art animation, Fireboats of 9/11 takes viewers behind the scenes of the famed New York City Fire Department Marine Division, documenting their incredible courage and effectiveness on September 11, 2001, as well as their long and exemplary history of safeguarding lives and property along New York’s waterfront. Crew members of fireboat John J Harvey, visiting Oyster Bay for Oyster Festival 2011, will take questions from the audience. Based on the success of last April’s Preservation Workshop, the Oyster Bay Historical Society will hold a lecture of best practices for maintaining and storing personal textile collections. Topics to be discussed include environmental threats and signs of infestation, safe handling and storage, and disaster recovery techniques. Included in the lecture will be examples taken from the textile collection of the Society. 20 Summit Street, Oyster Bay, NY. 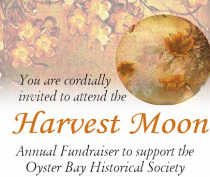 Free to members of the Oyster Bay Historical Society, non-members are $10.00 each. Light refreshments will be served. Attendees are encouraged to bring items that they feel need to be discussed specifically. No appraisals will be given as this is strictly regarding preservation practices. Contact Nicole Menchise at 516-922-5032 or by email obhslibrary@optonline.net for details or to make a reservation. 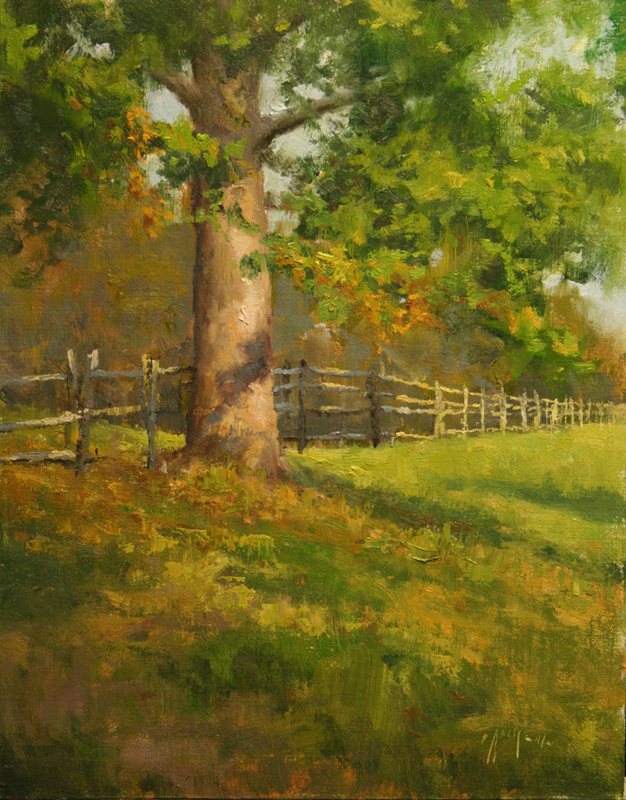 The Oyster Bay Historical Society collaborated with Teaching Studios of Art in Oyster Bay for the first annual Plein Air Competition, which took place at Sagamore Hill on Friday and Saturday, September 9 and 10, 2011. The competition’s art was taken straight from the easels to be exhibited at the Oyster Bay Historical Society’s Koenig Center, where it remained on view to the public through Tuesday October 4. An opening reception was on held Saturday September 10, 2011. Plein air painting has a long tradition on Long Island, perhaps most notably practiced at William Merritt Chase’s Shinnecock Hills Summer School of Art during the 1890s. Students included Joseph Stella, Katherine Budd, Lydia Field Emmet, Rockwell Kent, and Arthur B Frost, among others. Chase biographer Keith Bryant claims that “Chase’s summer program initiated the movement in art education to provide formal instruction in pleinairism in a structured environment.” At any rate, schools like it soon followed in Provincetown, Cos Cob, Old Lyme, Woodstock, and Avalon. Special thanks to Utrecht Art Supplies and American Artist for their help with the plein air competition. James Stuart Blackton (1875-1941) was an American film producer of the silent era and founder of Vitagraph Studios. 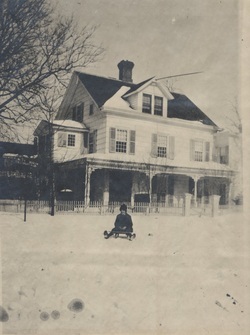 Blackton lived with his wife Paula and daughter Marion on the estate he called Harbourwood, a Federal-style farm complex in Cove Neck designed by the architectural firm Hoppin & Koen in 1911. The 80-acre estate, situated between Sagamore Hill and Louis Comfort Tiffany, spanned the width of Cove Neck. His grand boathouse, located on the shoreline of Cold Spring Harbor, had three guest bedrooms for the yacht-crew and a second-story ballroom. The boathouse was used for entertaining the Gold Coast society guests and the emerging stars of the motion picture industry. 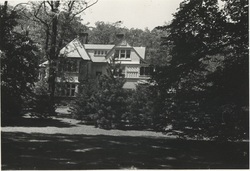 The Federal-style farm complex, the caretaker cottage, and greenhouse still exist, but the boathouse was torn down in 1963. An avid power boat racer who shared his relish for racing with his wife Paula, Blackton entered Baby Reliance II in the 1912 British International Harmsworth Trophy competition in Huntington Bay. He held a long-term membership in Brooklyn’s prestigious Atlantic Yacht Club, where he served for many years as Commodore (a term of address, in fact, that he preferred throughout his life). Blackton's performing career actually started in vaudeville with Albert E. Smith (who would become his partner in Vitagraph) and Ronald A. Reader, but failing to earn enough money, the trio broke up. Blackton soon found a new career as a reporter and artist for the New York Evening World newspaper and was sent to interview Thomas Edison. Edison encouraged Blackton to get into the business of movie making, selling him film and a Vitascope (film projector). Thus the American Vitagraph Company was born. His work at Vitagraph Studios made his fortune and established him as a filmmaking pioneer who was among the first to use the techniques of stop motion and hand-drawn animation. J. Stuart Blackton ran Vitagraph Studios, produced, directed, wrote and even starred in many of his films including Happy Hooligan. In 1906 he directed Humorous Phases of Funny Faces, which uses stop motion and stick puppetry to reproduce a series of animation. Blackton and Smith sold Vitagraph Studios in 1925 for a considerable profit. 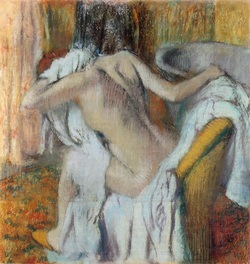 Despite financial success and setbacks Blackton considered himself an artist. Whether a young painter on the Battery or as a film producer in Hollywood he never lost sight of his artistic vision. James Stuart Blackton. Young America. James Stuart Blackton (1875-1941), was an Anglo-American film producer of the silent era and founder of Vitagraph Studios. He lived briefly on his Harbourwood estate in Cove Neck, where he maintained a grand boathouse (no longer extant). In the 1890s, before establishing himself as a brilliant innovator in film and animation, he worked as a cartoonist, reporter, and an avocational marine painter. 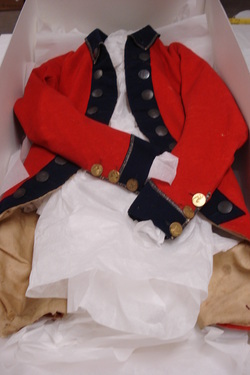 Young America originally appeared at the Oyster Bay Historical Society as part of the exhibition The Story of Commodore Blackton, 4 June through 21 August 2011. In celebration of Preservation Week, Nicole Menchise and Philip Blocklyn of the Society's professional staff will engage the Oyster Bay community in a discussion of best practices for maintaining and storing what we all hold most dear-- the unique family treasures that make up our personal collections. Topics include techniques for repairing and safely storing papers, books, textiles, photographs, and film. Those in attendance are encouraged to bring items for specific attention regarding best practices. The Roosevelts Next Door...Portraits of Devotion, reveals the life of the other Oyster Bay Roosevelts who were not the politicians, but were a famous influential American family who contributed to the building of this great country. On exhibit for the first time will be the private family collection of James Alfred Roosevelt detailing their humanitarian support for the Union soldiers in the American War. 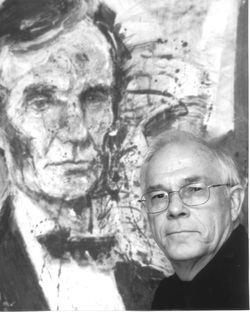 Complementing the collection will be the dramatic portraits of Theodore Roosevelt and Abraham Lincoln for sale by the internationally renowned artist Dan Christoffel. In November 2010, the Oyster Bay Historical Society acquired a major new collection of Rooseveltiana, whose highlights form the basis of The Roosevelts Next Door: Portraits of Devotion. 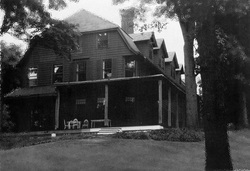 Elizabeth Roosevelt’s donation of her family’s letters, photographs, documents, books, and artifacts represents over 150 years of personal and public-service records, beginning with the correspondence of Wall Street banker James A. Roosevelt, an uncle of Theodore Roosevelt and a resident of Yellowbanks, the Cove Neck estate he built in 1881. James Roosevelt was instrumental in supporting the humanitarian efforts of the Sanitary Commission (precursor to the American Red Cross) during the Civil War. His papers include a significant letter from General William Tecumseh Sherman, written on the eve of his Carolinas campaign near the close of the war. But the wide-ranging collection holds more personal remembrances as well: an informal letter from Theodore Roosevelt describing pillow fights with Archie and Quentin, or fragile sprigs of evergreen from Abraham Lincoln’s funeral bier, tucked neatly into small envelopes for distribution among various Roosevelts. The Roosevelts Next Door: Portraits of Devotion serves as the inaugural exhibition in the Oyster Bay Historical Society’s newly-built Koenig Center. It presents the life of another branch of the Roosevelt family—not political but influential nonetheless in their service to their country, and in their devotion to one another. Both Abraham Lincoln and Theodore Roosevelt understood that the American people treasure and preserve their democracy as the very heart of the American experiment. These two great Presidents each recognized the individual as the essential face of the nation. Their own faces, expressive and profound, have become the vehicles by which, through different media and techniques, I interpret my understanding of the American character. Dan Christoffel’s portraits of Lincoln and Roosevelt are on exhibit at the Koenig Center in conjunction with The Roosevelt’s Next Door. Revenue from their sale goes in support of the Oyster Bay Historical Society and its mission to preserve and make accessible the history of Oyster Bay. 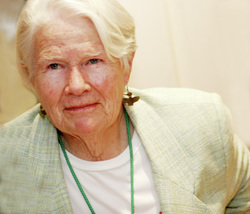 The Oyster Bay Historical Society is grateful to longtime Trustee Elizabeth Roosevelt for the generous donation in November 2010 of her family’s papers, which form the basis of the inaugural exhibition in the Angela P. Koenig Research and Collection Center. The Society wishes to thank the Dolan Family Foundation and all Society members, friends, and supporters, whose generosity and hard work have made this exciting new step possible.